I can’t agree more! Libraries and museums have so many opportunities, capabilities and resources to connect to the community in a unique way. 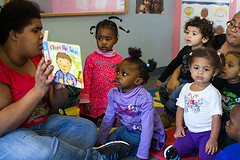 Well-crafted, collaboratively-created programming can enhance and support early learning as well as jump start relationship building and access to community support networks. Taking the time to engage community partnerships and collaborative efforts to benefit our young ones is well worth it!